Serenissima is a truly enchanting Balinese-style villa. Designed by the renowned Italian architect, Paolo Piva, in 1999, it provides serene living, dining and sleeping areas. 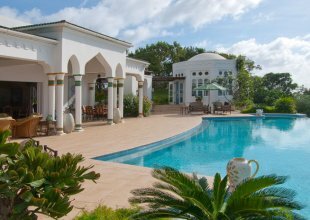 It commands magnificent views overlooking a one-time cotton plantation, with panoramic views of both the Caribbean Sea, the Atlantic and the neighbouring Grenadine Islands. Inside the villa, each of the four large bedroom suites is decorated with Balinese antiques and furnished with crisp, white bed linens. 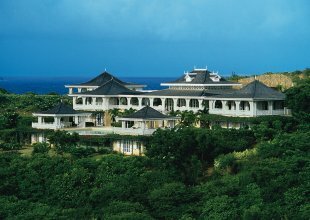 Every bedroom has its own verandah overlooking Macaroni Beach - one of the island's finest beaches - which is only a few minutes away. Guests can step from the villa's dramatic living room to the sun deck and large, stone swimming pool, or take a garden path to a romantic, secluded gazebo - perfect for enjoying sundowners while watching Mustique's magical sunsets. The tropical gardens with large lily pond surround the property creating a beautiful, natural backdrop visible throughout the villa. Menus and special dietary requirements and requests can be discussed prior to your arrival. Alternatively, wait until you are on-island to discuss your food preferences with the chef or butler - or where you might like to dine - perhaps have a BBQ on one of 9 spectacular beaches, or choose a candlelit setting within the romantic gardens of Serenissima. The Chef, Nicole Patrick, has been at Serenissima since February 2008. Previously she was chef in Canouan where she received special training from International Executive chefs. N.B. An 21% island tax is applicable to all villa rental prices. Serenissima has tropical gardens which surround the property. Set within an inner courtyard garden, surrounded by the living areas and 3 of the bedrooms, is a huge and magnificent lily pond. Tropical flowers and cool Palm Trees form an idyllic backdrop to the pool area with panoramic views of the Caribbean and Atlantic beyond. Serenissima has spectacular, panoramic views looking across from the Caribbean Sea to the Atlantic and the neighbouring Grenadine islands. The views from the bedroom verandahs stretch over Mustique's beautiful Macaroni Beach - famous for its surf and just 5 minutes walk away.